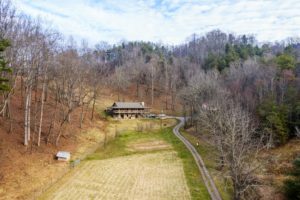 This secluded farm just north of Asheville is our newest listing. Its an outstanding 3BR/3BA home on some amazing acreage. It occupies a private cove at the end of the road, ensuring total privacy and security. Acres of sundrenched pasture and fields provide ample area for gardening or livestock. The house is offered with 10 acres for $598,900 or with 30 acres including a barn and pond for $819,900. This property has it all: privacy, southern exposure, pasture, woodlands, spring, pond, barn and an exquisite house. There are two wood stoves in the house, a transfer switch for a generator plus a detached garage with fully finished and conditioned living space above. But the most impressive feature is the kitchen. The owner was an executive chef and he designed it. Has an industrial strength six burner range with side by side ovens and a monstrous exhaust hood ideal for canning. Click here for the full listing package and photos, then call to schedule your private tour.